In winter, bundle up and challenge the cold. 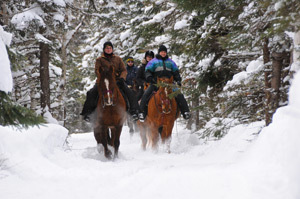 You can go horseback riding, enjoy a horse drawn sleigh ride with your friends or for a larger party. Think of the fresh air and a pristine snowy decor for your ride. • Horseback ride of 1 hour or 1 hour 20 minutes. 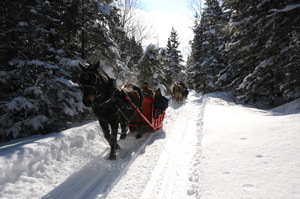 • Horse drawn sleigh and sleigh ride of 50 to 60 minutes or one hour 20 to 30 minutes.